Bloodletting or phlebotomy was a standard medical practice and treatment for thousands of years. Blood was thought to build up in excess and then stagnate in certain areas of the body. Removing the extra blood would restore the natural balance of the body. Until the end of the nineteenth century, there were few medicines that physicians could prescribe that actually cured a disease. The standard practices employed were 'copious bleeding and massive doses of drugs.' (Lois N. Manger, History of Medicine, New York: Marcel Dekker, Inc., 1992, p. 205). 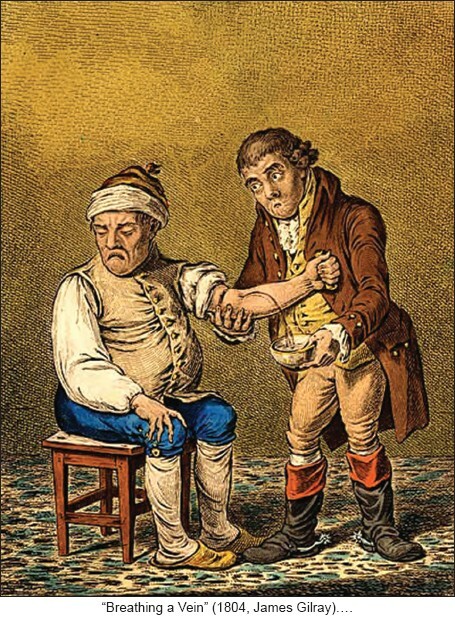 The common therapies employed by physicians to cure diseases were bloodletting, puking, and purging, and such practices were often portrayed as caricatures, as in the example on the left. James Gilray was one of the leading caricaturists in the nineteenth century, in England. Gillary's use of vivid facial expression also captures the patient's reaction to such a treatment. The piece above is titled, "Breathing a Vein." The patient disdainfully looks away as the physician bleeds his arm. The title, "Breathing a Vein", suggests that the procedure was a pleasant way to allow the vein a little air. The reality of the procedure was something else, as the cartoon suggests. A tourniquet was placed above the elbow, the artery in the forearm was punctured by a lancet, and the blood, gushing like a fountain, was captured in a bowl.